Located just a short walk from Cardiff city centre, Lincoln House Hotel offers a luxury stay in a great location without breaking the bank. This wonderfully restored hotel brings a contemporary feel to a beautiful Victorian townhouse, set on a spacious, leafy road, you won’t feel as though you are in the heart of the city. 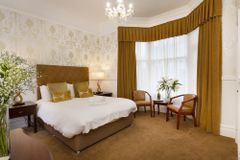 The Lincoln House Hotel is fully equipped to ensure everything you need for your city break is on hand, they even have connections with local restaurants so dinner can be charged to your room. The Lincoln House Hotel is warm and welcoming from the moment you step through the door. The friendly staff are on hand to help you with anything you may need, from hotel-related queries to organising days out in the city. The facilities at Lincoln House are first-class, including complimentary WiFi access in all rooms and a full Welsh breakfast each morning of your stay. The resident’s lounge is the perfect spot to unwind after a day on the fairways, offering a wide selection of drinks and snacks. For those who drive into the city, the hotel has its own secure car park.